This is a fantastic video for photographers. 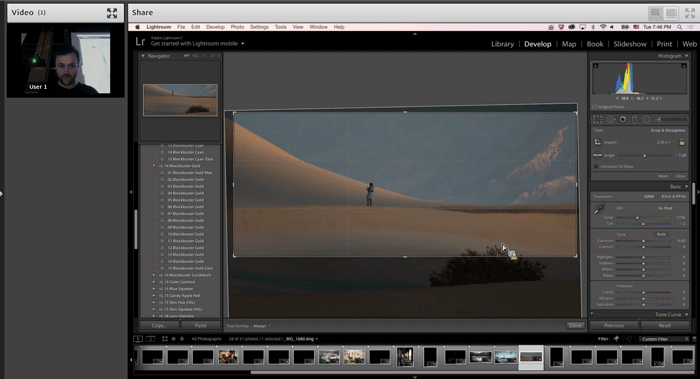 In the video, visual artist Stu Maschwitz sits down to a blacked-out Lightroom catalog loaded with a couple dozen photos submitted by strangers, and one by one he unveils and processes them as the whim strikes him, providing a running commentary about his artistic reasons for doing things, or technical comments about how to achieve in Lightroom whatever look he's going for. There are some amazing transformations, but whether a particular result is or isn't your cup of tea is not the point. The point is to see that amazing transformations can be made so easily, and sometimes so subtly. The running commentary on the hows and whys provide ample little seeds that may germinate ideas when processing your own photos. It's just Stu looking at a stranger's photo and instantly deciding what that photo's “story” is to him, and then proceeding to crop and adjust the photo so that as far as he's concerned, it better tells that story. I found it highly entertaining, and I came away both with new artistic techniques and new Lightroom techniques. If you're a photographer, I highly recommend it whether you use Lightroom or not. Try your hand at developing a few of my raw images, and compare your results with others for yet more ideas and inspiration. Very cool. Many years back, I learned a lot about color grading for video from Stu’s tutorials (and I’ve used his Mojo plugin for Final Cut for several video projects), but it’s cool to see him apply the same grading sensibilities in Lightroom. Hi Jeffry. I’m very interested to watch, but I’m having some trouble with Adobe Connect. Any suggestions? Thanks for recommending this screencast. An hour and a half well-spent, loads of inspiration! I had no problems to watch it in Firefox 35.0.1. And really cool video. Normally I don’t like to edit my pictures too much, but the process Stu shows looks fun and definitely delivers. Jeffrey, which picture worked upon struck you the most? To me it was the Ohio waterfall, because of the use of gradients and the way the light turned out in the finished shot. The burning man, lol, because Stu tones it really heavily and makes it look natural in the end. The airplane, because shoot raw, :p And several others.